Strategic communications actions amplify your project's impact by raising more funds, generating attention and momentum, engaging key agencies and authorities, inspiring supportive regulatory change, and expanding the scale of your work. 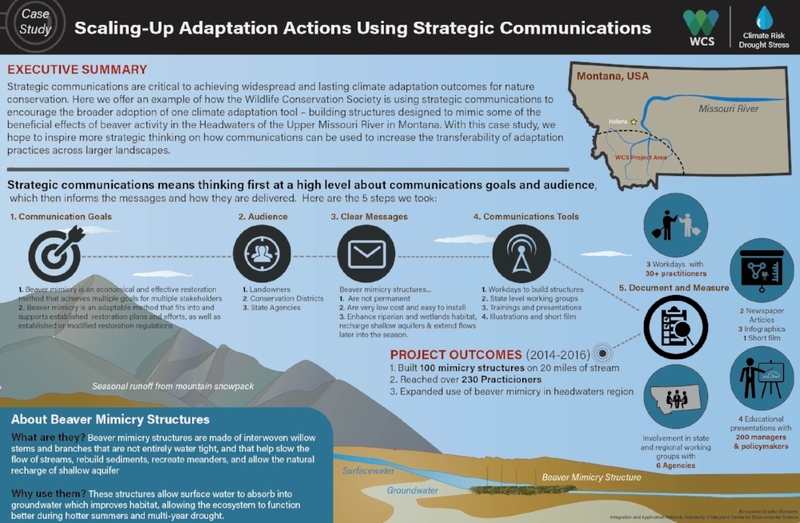 Using communications actions to scale conservation impact and share your results and approach is crucial for a field as nascent as climate adaptation. Scroll below to learn how. By more effectively engaging conservation practitioners, decision makers and other relevant stakeholders about the value of and methods for climate adaptation, practices can scale more effectively across a landscape. This guide offers a step-by-step approach to how to create the right communications plan for you. A super light version of strategic communication planning. Use this single page worksheet to begin devising your communications plan. The core components of a strategic communications plan. Rising temperatures, lower snowpacks, earlier spring melt and a multi-year drought in the Headwaters of the Missouri River are already putting stress on wildlife and water users. Communication goal: Encourage broader adoption of beaver mimicry techniques by providing practical, hands-on learning opportunities for relevant decision makers and resource managers to see and better understand the benefits of beaver mimicry structures. The Wildlife Conservation Society worked with private landowners, landowners, local conservation districts, and State and Federal agencies to showcase structures designed to mimic some of the beneficial functions of beaver activity. Using a relatively simple technique that weaves together willow branches, these semi-permeable “speed bumps” help to slow the flow of streams, recreate meanders, and boost the storage of water in soils beneath riparian areas. These changes in turn help riparian vegetation recover, further adding to the capacity of watersheds to function as 'sponges', capturing water when it is plentiful and releasing it during dry periods. The Montana Department of Natural Resources and Conservation, and Conservation Districts were identified as critical audiences because of their role in state water law (water rights), permitting riparian restorations, and interest in cost-effective solutions for natural water storage. Beaver mimicry structures are not dams, they are non-permanent permeable structures that help: 1) restore the 'sponge' function of healthy watersheds by passively recharging groundwater and restoring riparian and wetland habitat; and 2) are a relatively inexpensive watershed restoration tool that can be adapted to meet a broad range of goals.